We all know that girls get most of the love when it comes to kids fashion. Boys aren't catered to quite as much, which is why it is really lovely to find a label designed just for boys. Melbourne-based Amanda Moore wrote to me recently to introduce her lovely label Hunter Baby for boys only (yeah!) from newborn to size one. In collaboration with fellow mother Belle Anderson, Amanda is leveraging her background in fashion design to create classic styles and no-nonsense designs for little tykes. 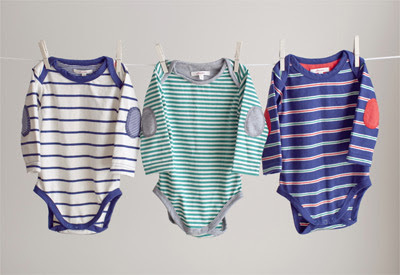 The Winter 2011 collection includes onesies, pants, tops, wraps and bandana bibs in preppy stripes and colourways in 100% cotton. It's the details that really elevate the range - you'll find elbow patches and multi-coloured buttons, embroidery and contrasting linings. It's a classy collection with basics that won't ride up but will turn heads. Nanna would definitely approve. But wait, there's more. Amanda and Belle from Hunter Baby are offering the iconic Oscar Onesie Top to one lucky Bondville reader to win! All you need to do is comment below with your favourite boys' name; winner to be chosen by Hunter Baby. This competition is open to Australian and international readers! Entries close midnight AEST Wednesday 8th June 2011. Thanks Hunter Baby! You can find Hunter Baby in the online store as well as at stockists in Victoria. 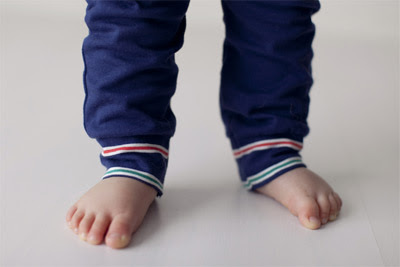 Head over to Bondville Kids to find more great Australian-designed fashion for children. 2. To enter, simply comment below with your favourite boys' name. 4. This competition is open to all readers in Australia and internationally. 5. This competition is hosted by Steph Bond Hutkin via the Bondville blog at blog.stephbond.com and the Bondville Kids blog at babydesignerclothes.blogspot.com. 7. Entries close 11:59pm AEST, Wednesday 8th June 2011. 8. 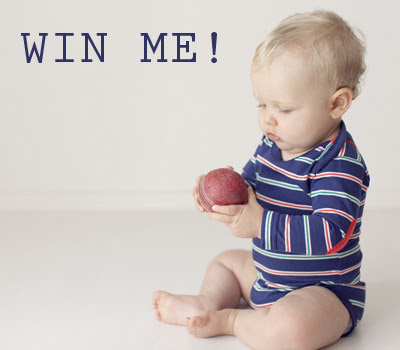 This competition is a game of skill and the winner will be based on the most interesting comment as judged by the Hunter Baby team, and notified by email and via a post on Bondville on Thrusday 9th June 2011. My fav boy's name is Joe cos he is my boy but I really love the name RAMONE! Plus how can you not love Ferris Bueller? "Life moves pretty fast. If you don't stop and look around once in a while, you could miss it." Oh wow, am really pleased to discover Hunter Baby! Thanks for sharing Steph - their clothes are sooo cute!! My favourite boys name is Ari, as that's the name of my little man :) It means lion or eagle.. I was pleased to discover after we had named him that it is also an old Dutch name - my grandparents are Dutch so that was really quite special. Our first little one is due in 4 weeks and if we have a boy we would like to call him Otto which I think sounds lovely and strong. Now and then I find myself daydreaming of Oscar and Otto growing up together, the best of mates, sharing adventures, and one day sitting on the porch as old men together too! My favourite boys name is Seth as it is the name of our firstborn! Gorgeous clothes! I do LOVE Darcy...although couldn't get hubby to agree to it for either of our boys! I LOVE the name Hunter! We would probably go with Hunter Joseph! Will and Hugh are my favourite boys names. Either of these gorgeous boys would look super stylish in a Hunter Onesie & are sure to be great advertisements for the Hunter label (at least their biased Mum thinks so). Wow ! How cute are those onesies ? My favourite boys name is Elliot but Harper is a close second. Nice blog.